The day that we Americans lay claim to our Irish heritage by doing all sorts of things that Irish people never do. Like dye your hair green. Or tell everyone what percentage Irish you are. Despite my given name, I'm only about 15% Irish. So my Irish portion weighs about 25 pounds. It could be the portion that hangs over my belt due to excess potatoes and beer. Today, many American cities compete for the honor of being "the most Irish." Who deserves to take top honors? Data from the U.S. Census Bureau can help us decide. 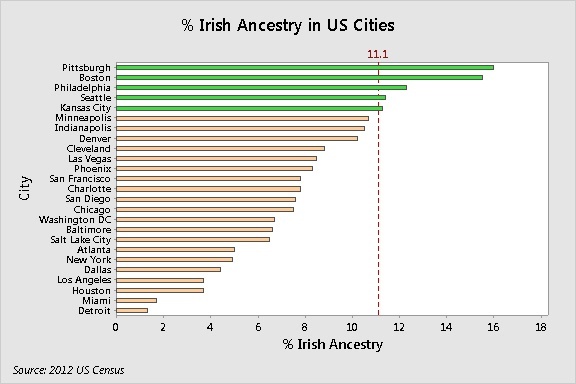 The Minitab bar chart below shows the percentage people with Irish ancestry in major U.S. cities. It's surprising that Bostonians are out-Irished, percentage-wise, by Pittsburghers. But die-hard Gaels from Beantown can take comfort in the margin of error for these estimates. For Pittsburgh the actual U.S. Census Bureau estimate is 16.0% ± 0.7%. For Boston, the estimate is 15.5% ± 0.5%. So, statistically speaking, neither city can claim with confidence that it's the most Irish of large cities in the U.S.
New Yorkers and Chicagoans could also take issue with the above chart. After all, you could argue that it's sheer brute numbers, rather than percentages, that give cities their Irish heritage heft. The Minitab bar chart below shows they'd have a point. The reference line represents the population of Limerick, the 3rd largest city in the Republic of Ireland. 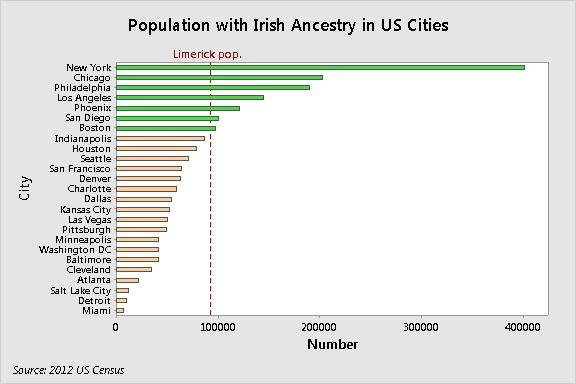 The number of those with Irish ancestry in the Big Apple comprises a large city by itself (≈ 400,000). Together, New York and Chicago have more citizens with Irish ancestry (≈ 600,000) than the city of Dublin (≈ 525,000). Based on this chart, even lads and lassies from Phoenix can proudly dye their hair kelly green. Although they probably won't have much luck looking for four-leaf clovers in the desert. Notice that only Philadelphia and Boston get to wear green in both bar charts! Note: If you want to find out whether your city can wear green on either bar chart, download a Minitab project with the data here. Then go to U.S. Census Bureau and use the Advanced Search for race and ancestry for your city. In the Search results, use the 2012 ACS 3-year estimates for Selected Social Characteristics in the U.S. In Minitab, add the name of your city and the % and count estimates for Irish ancestry to the worksheet. Then right-click the bar chart and select Update graph now. If your city deserves to wear green, double-click the bar and change the color. If we had more time, we could debate these estimates further over a green beer. But ultimately it's not really about the numbers. It’s about what’s in the heart. 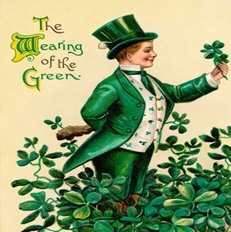 And gives us the true spirit with which to say... E pluribus unum...and Happy St. Patrick’s Day!